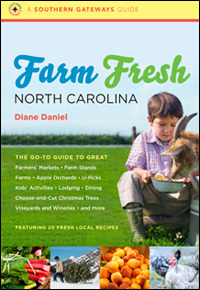 Farm Fresh North Carolina, the first statewide guidebook of its kind in the country, takes readers on a lively tour of more than 425 farms, produce stands, farmers’ markets, wineries, children-friendly pumpkin patches and corn mazes, pick-your-own orchards, restaurants, bed and breakfasts, agricultural festivals, and more. All destinations are open to the public and have been personally vetted by travel writer Diane Daniel. The book also includes twenty recipes gathered from North Carolina farmers, innkeepers, and chefs, as well as sidebars about the state’s agricultural history, politics, and eccentricities. Emphasizing farms and establishments that are independent, sustainable, and active in public education and conservation, Farm Fresh North Carolina will help Tar Heels and tourists discover how the burgeoning farm movement has become a bridge between North Carolina’s past and present. 3 Responses to What’s Inside? That’s great, Loretta. Thanks for letting me know. am visiting this web site dailly and get good data from here every day.